In 2013 we made $817.70 in rewards and bonuses from our card cards. Our main credit card has been the American Express TrueEarnings card through Costco. Most of the rewards and spending was through that Amex card. However the Amex card barely earned over 1% overall and our better rewards where through promotional 5% deals and a $200 signup bonus with a new Chase card. I've been trying to watch for and better use the 5% promotional rebates with our cards. We used our Citibank and Discover cards some mostly to take advantage of 5% deals. I also got that new Chase card and we used it some both to meet the minimum purchase requirement to earn the $200 sign up bonus and to take advantage of their 5% deals. Almost all 5% bonus for online shopping in Q4. I got a $200 sign up bonus and the rest was primarily shopping at Amazon for the 5% bonus. The amount we earned was pretty good in total. I'm happy with $817 in extra money for sure. However I am sure we can increase this through use of other cards. I've been considering getting the Amex card through Fidelity which pays 2% into a Fidelity account. That would nearly double the $439 + $25 we earned on our Amex Costco and Citibank cards since that was mostly all 1% spending. I've also decided to watch for and sign up for more promotional deals like that $200 bonus from the Chase card. I figure it would be no problem to sign up for 1-2 new cards a year just to cash in sign up bonuses. 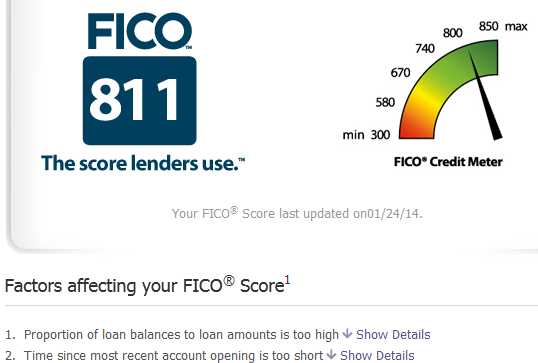 My credit score is over 800 and can easily withstand a hard pull once in a while. Most people get a refund on their taxes in any given year. Generally speaking around 80% of people filing taxes get a refund. 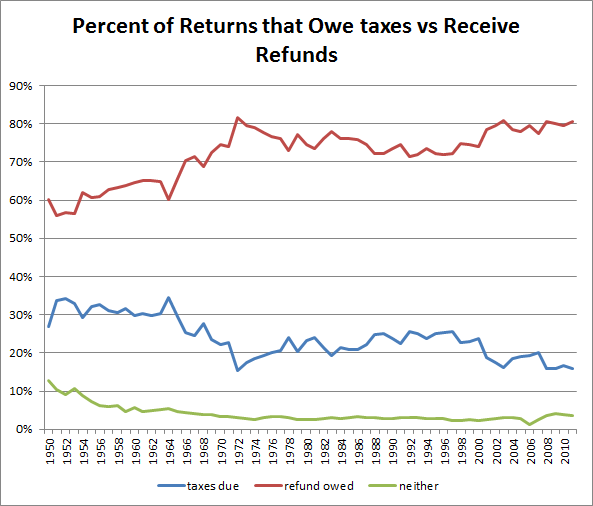 I found the historical IRS tax data going back to 1950 showing who gets refunds versus who owes taxes. I am sure there are various things that drive the longer term trends. IRS tax withholding processes have undoubtedly evolved over the decades. Things like more dual income households may impact it as well. The introduction of earned income tax credits may have increased refund rates as well. The green line indicates people who get neither a refund nor owe money. I'm assuming thats mostly for people who had no money withheld but owed nothing. Maybe people like retirees on social security and minimal other income. No. Its not going to happen. Stop expecting it. Whatever you do .... DON'T make financial plans around it. There is not going to be a student loan bailout. I thought this story had died out months ago but just recently I saw someone still talking about the prospect for a bailout of student loan debts. The government isn't going to just write off over $1.2 Trillion in debts because some people would benefit. There are many people who do struggle to repay student loans, this is true. But most people are certainly willing and financially able to pay their loans back. In either case we can't expect free money to come from the government any time soon. Honestly a student loan bailout is just a misguided pipe dream. The bigger reason that there isn't going to be a bailout is that we've already had bailouts. For people struggling with their student loan debts there are already government programs to help them and get at least partial forgiveness of the debts. There is the new Pay As You Earn Repayment Plan which has 20 year forgiveness. Which is added to the existing Income-Based Repayment Plan (IBR) which includes 25 year forgiveness plan. And if you go into public service then there is the Public Service Loan Forgiveness which has 10 year loan forgiveness. These programs aren't simple blanket loan forgiveness for the entire nation as some people delusionally expect but they are certainly a very big helping hand for those who really need it. I know that student loans are a burden to many people who have high debt levels and lower paying jobs. But thats what the income based and pay as you earn repayment plans are setup to help with. Now unfortunately those plans do not work with private lenders and many of the people in the worst situations are burdened with high private loan debts. I don't expect any major changes or aid for people with large private loan debts. Personally I think it would be a good step if they would force private lenders to all offer a income based system at least. As it is you can't get rid of student loans in bankruptcy so you're stuck with the private loans for life, and I don't see what harm income based system would do there. MyMoneyBlog finds the answer to Can I Really Withdraw My Roth IRA Contributions At Any Time Without Tax Or Penalty? Haven't you always wanted to know how much the citizens of the USA owed in auto loan debts in 1978? Well today's your lucky day! The answer is approximately $83.5 billion. Can't get enough of historical debt figures? Well then read on! The inflation data is from the BLS CPI. To make it a little simpler I just pulled out data for January of each year. I assume that there aren't any major changes month to month really and if so they're likely seasonal in nature. 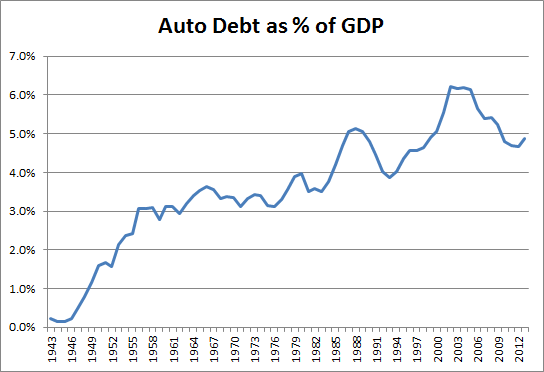 Our auto loan debt has gone up pretty steadily over the past 70 years. Even when adjusted for inflation the values have climbed pretty quickly. 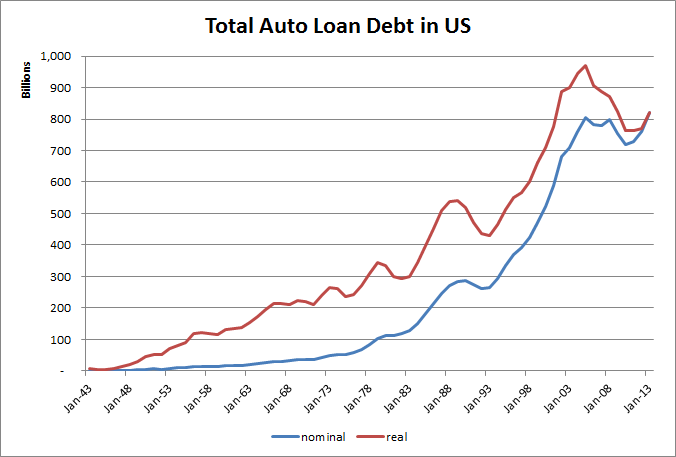 In hindsight it seems pretty clear that the "Great Auto Loan Bubble"burst in 2005. I mean just look at that red line up there! pop! I'm glad we all made it through that one. I think its also always good to look at large financial figures like this as they relate to GDP. So I got the US historical GDP figures from the BEA and plotted auto loan as % of GDP below. There the change is less drastic as we bought more cars as our economy grew. But still auto loan balances grew over the decades. In the 1950's we were around 3% and then it peaked in now we're just at 4.9%. How Many People Claim Itemized Deductions? What and How Much Do People Deduct? 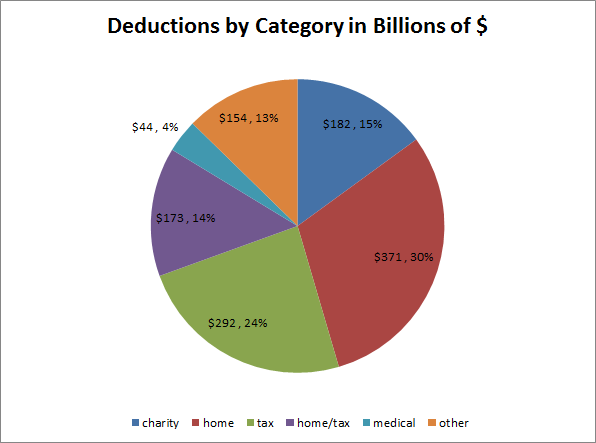 46,293,834 returns claimed itemized deductions in 2011. If you add it all up, theres over $1.2 trillion in itemized deductions. If the 46 million filers instead claimed a $6100 single deduction they'd have $282 B in deductions and its likely more than that since many itemizers are married or heads of households. The standard deductions would be somewhere between $282B and $564B. I put the deduction for real estate property taxes into its own category of home/tax as its both a homeowner related deduction and a tax deduction. Unfortunately it looks like the rents are trending downward in most locations. B,C & D are all negative. E is pretty flat. The one house 'A' is up 8.8% which is a pretty hefty increase and thats actually pretty good for us since its quite possible that one will be vacant before too long since we've had problems with that renter not paying rent in a timely manner. Our trash disposal stopped working this weekend. When we would push the button it wouldn't do anything. We were about to call a plumber when I remembered something about a reset button on the disposals. Underneath the disposal is a red reset button. I tried hitting that and then tried the disposal again. Now the disposal would make a humming noise. But it still wouldn't do anything. Again we figured best to call in someone to look at it. I figured we'd be in for a $100 service call bill. Oh well, at least a disposal is something you can live without until its fixed. I decided to take one more stab at troubleshooting it and looked up the manual for the disposal. We have an insinkerator model disposal. I found the actual service manual for the model in question and it said to try turning a manual crank on the disposal to clear a jam. Insinkerator has a page with basic information on how to fix a broken a disposal. I had to find the little wrench for the disposal but once I found it and used it to turn the crank I could feel it grinding through something. It was tough to move for the first turn or two but then it seemed to clear up. After that I turned it back on and presto it worked again. Now I'm not the first person to fix a trash disposal in this way and I'm sure many of you already know these tricks. If you don't know how to do this then you could probably look it up on the internet fairly quickly. I did a Google search for "how to fix a trash disposal" and the first couple results were Youtube videos which walk you through the process. Note: You do need to be careful when working on something like a trash disposal. Make sure to follow proper safety precautions. How Much Does It Cost To Leave Our Door Open in The Winter? I have some frugal habits that are pretty ingrained in my personality. One of the habits is not to leave the door open when its cold outside. Sometimes I see people who do not always close a door quickly when it is cold out. Anytime anyone has a door open for longer than a few minutes in the winter I start to get uncomfortable about it. And 'uncomfortable' is the right word to use too, it kind of makes me a little upset to be honest. Its almost as if someone just lit a $10 bill on fire for no reason. But it has occurred to me that I don't really know how much heat this wastes. I mean I know it wastes heat, that much is common sense, but I don't know HOW MUCH heat is wasted. There are frugal things that I do and don't do based specifically on how much they cost. So if I"m going to get upset about an wasteful habit then I should really at least have an idea of how wasteful it is. I mean if it wastes $1 in heat every time someone does this and they do it every other day then that is $15 wasted heat a month. But if it only wastes 0.1¢ then I'm getting upset about nothing really. So the actual cost is pretty important to keep things in perspective. I couldn't think of a good way to calculate the heat wasted on my own. I searched Google and came up with a site that had done the math (I'm not sure if that information is from Questline or Rocky Mountain Power or both). They figured the amount of air that would move over an 8x10 opening based on different inside and outside temperatures. I'll look at the example for 40F outside temperature since I live in the fairly mild Northwest US and that is a more common winter temperature average for us. Their figures are based on natural gas at $1.20 a therm and an 80% efficient heater. Our heat is a bit cheaper than that actually I figured that our heat would be about 75% of their costs. 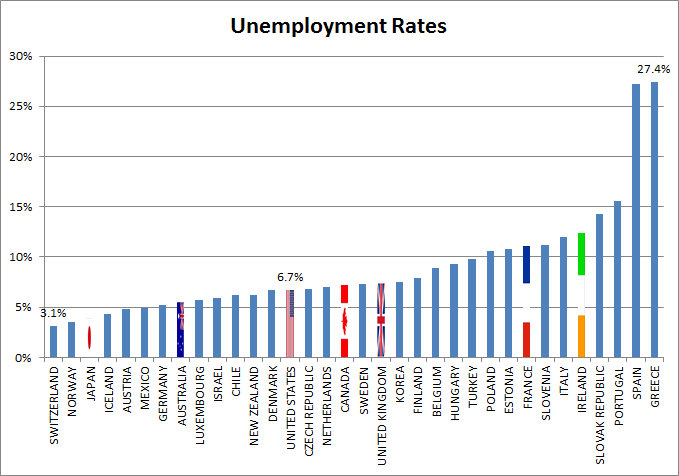 So when they figure that an open 8x10 door would cost $1.88 an hour our cost would be more like $1.41. Furthermore they are using an 8x10 door and our door is only about 3' x 8'. Our door is only about 30% as large. The $1.41 cost for a 8x10 door would be proportional to a 42¢ /hr cost for our 3x8 door. Translate that into a per minute cost and you're looking at 0.7¢ per minute for our front door and our heating system. Bottom Line : It probably costs only about 1¢ per minute to leave our front door open. That seems surprisingly low to me. Is this right? Did I make a math error? I'm seriously asking... Assuming its right, then thats not nearly as bad as I'd have thought. This actually helps me feel better about it. I am not going to get all bent out of shape if someone occasionally wastes a couple pennies by lingering at the front door.